40 Crossbowmen - Horde of shooters. 20 attacks is something to be concerned with and while they have Reload special rule (can't shoot after movement) they got the item that makes them hit on 4+. With crushing strength these shooters will do damage for sure so I had to be careful and don't give them many juicy targets. This time avoiding them might be a little easier due to 24" range (as opposed to 36" previously) but they will certainly make up for it with the better to hit ratio. 2 x 5 Sisterhood Panter Lancers - it is Basilean's version of light cavalry, very fast and nimble but unlike Silver Breeze they are combat orientated. They have Thunderous Charge (1) and Vicious that helps to go through with their attacks. However, they are also very lightly armored and may be vulnerable to enemy fire. This time there are two units of these and I predicted there will be some fast cavalry fights. 2 x Heavy Arbalest - completely new addition and some shooting support. They are cheaper than bolt throwers but have only 1 attack and hit on 5+. On the other hand they have d3+2 blast and piercing 3. That means that whatever hits will do more damage. I was curious how efficient they will be but at the same time needed to have a plan to eliminate them. 10 Paladin Knights - Darth combined two of the troops into single regiment this time and while the comparison stood between them and Storm Wind, now I had to compare them with the regiment rather than with troops. This unit is more dangerous in the frontal charge to my infantry (although Spears might be helpful here) but the good thing is it is a single target. I must say I was very excited about possible duels between respective unit types or their performance when attacking other targets. 2 x 3 Elohi - the best unit of the army, these angelic warriors are the most dangerous opponent. They don't waver and hit very hard. They are also Inspiring which is amazing on its own as it is already relatively hard to rout them with Defense 5+ and nerve -/14. Unlike with the Knights, Elohi were split into two regiments which I find much better if more expensive solution. First of all there are more sources of inspire. Second, more flying regiments that can counter my drakons and cover more area. Phoenix - the most intriguing addition to the army list in my opinion. It has a lot of very useful abilities. First, it is a flier with a breath attack 10 so that is very useful indeed. In particular against some fast cavalry operating outside the inspire range. It has only 3 attacks with crushing strength 1 so it is not a combat monster but it will be more than enough for war engines hunting. It has heal (6), amazing! It is another source of inspire which in itself is also great as it helps phoenix to survive more despite it being very fragile (defense 3+). But it also has a very useful Regeneration 4+ ability that combined with Iron Resolve army rule makes it tougher than it really looks like on the paper. That one flier will be another of the priorities to destroy and because there quite a few of flying nits in Darth's army I think it will be even more difficult to accomplish. 2 x 20 Paladin Foot Guard - same as last time, these guys can be there to help crossbows or move forward to aid faster troops. I like this army better because it appeals to my Combined Arms vision of a well working force. It has enough elements to counter mine one-by-one. It also has more flying elements, so I will have a problem with gaining air superiority for sure. All the fliers are also as tough as mine if not better. Even fragile phoenix can heal itself through regeneration and help others to restore the damage. I may have advantage in ground speed for respective unit types but only just and that is negated by the fliers. I have a shooting advantage due to the fact I have more elements that can shoot and are generally better shooters. However, in terms of magic Darth clearly has more support and he also has many more inspiring sources that would allow him to protect entire army without slowing his advance. Darth prepared a very nice table for this game. We had four hills - height 2. Three forests - height 4. A building and blocking terrain (the rock) of height 3. Two walls of height 1 as usual and a swamp that was difficult terrain. Darth won the roll off and chose North. At the beginning of the deployment I was a little confused as I could not decide on a formation. I tried to predict where enemy units might go and it was really hard to do so. One reason being that there were 4 flying units that can start in one spot but may move to another fast. 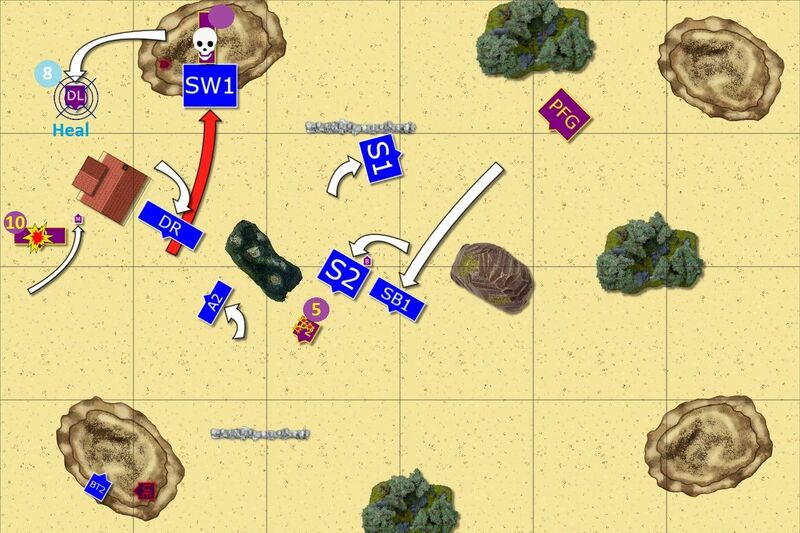 Then there were 3 cavalry units that were not slow either. In addition, the horde of crossbowmen can potentially delete a single unit of mine a turn so I wanted to be able to shut it down for a while and for that I needed my own fast elements to be able to charge. I started with fast cavalry behind the hills for protection from shooting but it also allowed me to place two fast units that can move to good position quickly anyway. What is more, I wanted them to hunt the panthers so I reacted to the placement of these. Enemy nimble units are very maneuverable but fast cavalry with bows can still reach them. I wanted my shooting to be efficient and I decided that in order to do so I will need to focus it on single target. That is why I positioned Archers and Bolt Throwers close to each other. It also meant that my opponent would have to be careful where his fast units go as there will be some units of mine in between ready to intercept. Spearelves were in the middle so that I could advance them through the center as soon as Crossbowmen are distracted and/or move towards the flanks if needed. I must say, however, I was not pleased with their positioning. I had a feeling they might be too isolated and too far away from inspire. At some stage it looked to me that Darth wants to split his army more or less in half. I decided to counter that with strengthening one flank and delaying the other. 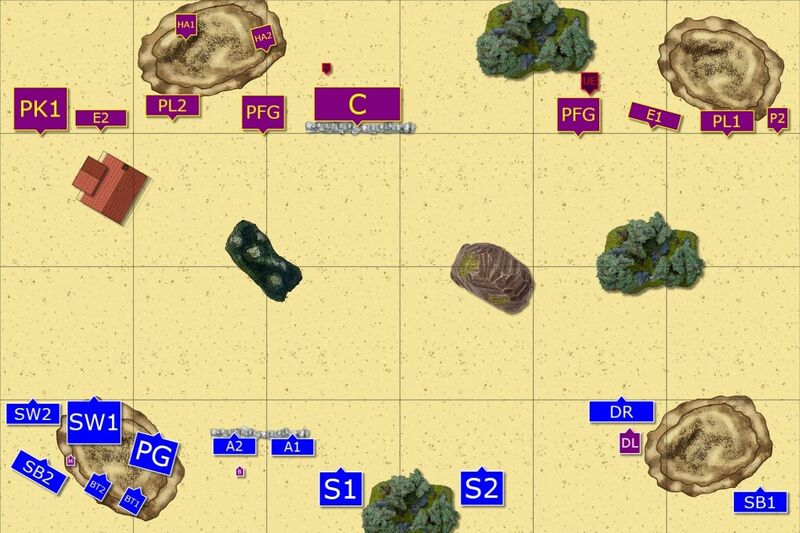 I positioned my fliers on the weaker flank because they have better range to intercept and it also looked like the right flank has enough terrain to keep each other in check without committing the units too early. However, I also wanted to get to the shooters fast and I didn't think Darth would leave me that nice corridor along left flank free. So I wanted to see if there is an opportunity to use great mobility of fliers to use any gaps in formation to move towards the crossbows. 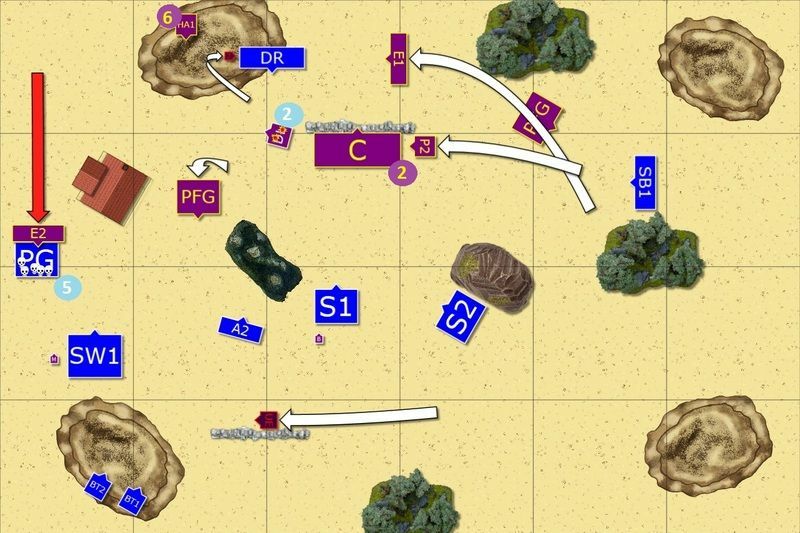 The situation on the left flank was not that easy though because Darth had some good units there, I didn't have numbers superiority, could get into range of crossbows and last but not least, it was simply crowded. 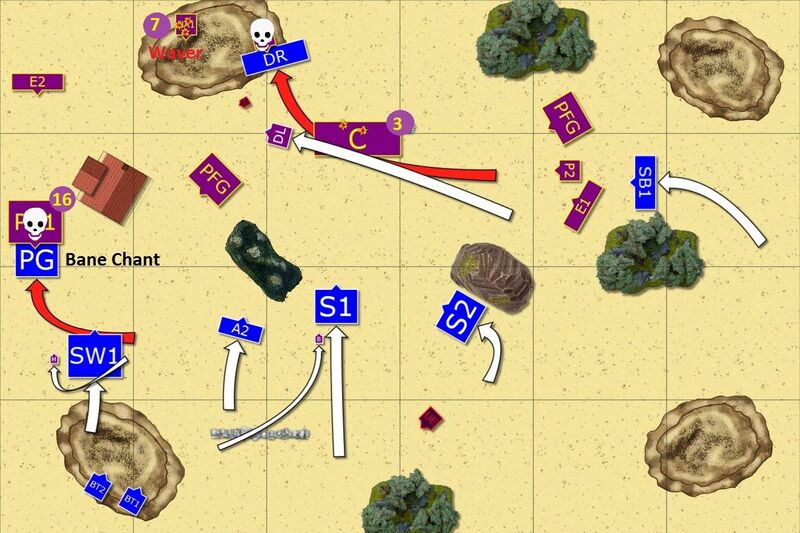 The good thing was that I could still shoot at his units while advancing and I wanted to use that to my advantage. 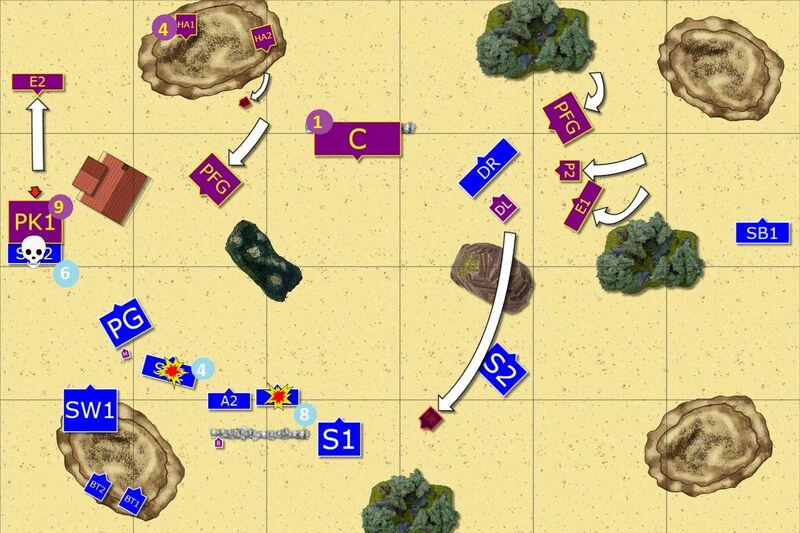 I needed to win that flank fast, however, before fliers from the opposite side start advancing towards my center. I won the roll off and decided to take first turn. Elves moved on the flanks cautiously and used their shooters to soften the enemy before the melee. There were many dangerous targets though and the decision what to pick as priority was not easy. On the left flank bolt throwers aimed at the Knights and in a round of good shooting they inflicted significant damage, although not enough to impress Paladins. Mage supported fast cavalry with bane chant and together with Archers they aimed at Panthers. Light Basilean troops wavered in result. On the right flank solitary fast cavalry aimed at the Phoenix and even hurt it a little but it was clear that regenerative abilities of the magical bird are working already. The Knights moved forward, tempting Elven cavalry to charge them while Elohi were getting ready to jump over. On the opposite flank Basilean regiments started to spread the nets to catch Elven drakons. Crossbows moved forward to get some targets into range as Elves were careful not to get there too early. Storm Wind cavalry charged enemy knights and supported by Elven magic unhorsed many of Paladins but their companions refused to break. Would Elves hold against a counter charge? Fast cavalry kept hunting down their adversaries and both Panther units were routed. Bolt throwers aimed at enemy artillery but didn't manage to destroy it. Finally, Drakons, sensing there is something dangerous coming, used a gap in enemy formation to escape and were heading towards the enemy shooters. Paladin Knights charged Elven cavalry and even without the lances that were broken by their enemies attack, they managed to route their foe! The shooters followed the example and two more elven units were destroyed! On the right flank all the units had to chase the drakons, with the exception of Ur-Elohi who was heading towards Elven war engines. Palace Guard charge victorious Knights and this time Paladins were routed. Storm Wind cavalry was still cautious and didn't let Elohi to jump over and threaten the war engines. At the same time Drakon Riders attacked Arbalest to avoid pursuing enemies. Drakon Lord moved forward at full speed too. Elven Bolt Throwers once again opened fire at their adversaries but despite significant damage could not rout the enemy yet! Elohi attack Palace Guard and damage elite infantry but frontal assault was not going to rout them, at least not this time. Ur-Elohi used nearby wall for additional protection, just in case. Phoenix spit fire at Drakon Lord and even wounded Elven hero! in the meantime, crossbowmen reformed to avoid rear attack of enemy drakon riders. Elves were in position for some more attacks and they executed these with no hesitation. Palace Guard counter charged Elohi but despite significant damage they could not route the angels. On the other hand, drakon riders and Storm Wind cavalry had no trouble in destroying Paladins. Drakon Lord didn't take chances and routed last Arbalest. Then Spear Elves happened to be just in the charge range of crossbowmen who exposed their rear to the enemy. It was a grievous mistake. Both Elohi units and Ur-Elohi charged their enemies. On the left flank Palace Guard routed despite Inspiring presence of their wizard! Bolt Thrower crew stood no chance against Ur-Elohi. Only Drakon Lord held his ground but was seriously wounded! Elves still had powerful units in reserve and they used them well. First, Bolt Thrower and Archers focused their fire on damaged Elohi and this time routed the angelic warriors. Then, thanks to the bravery of Drakon Lord, Storm Wind cavalry charged the exposed flank of second Elohi unit and destroyed them. 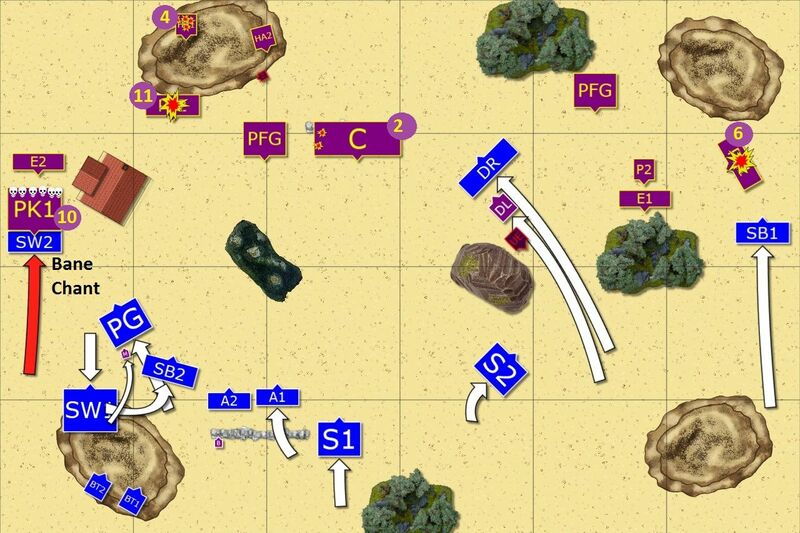 Remaining unit rearranged their formation and fast cavalry shot at the Phoenix again. At this moment we stopped the game due to lack of time but we also concluded that Darth would get my second bolt thrower and would avoid further losses even if there were 2 more turns. The Elves managed to repel another attack of Basilean army and carried the day. First of all I would like to thank Darth for a game, preparation of great UB map and writing his own report too! It is never easy to write one after a defeat but I can tell you that it is one of the best ways of improving! Here is the link to his report, please, make sure you visit his new blog and leave a comment or two! At this stage of learning of the game it is still more about trying some ideas and checking how they are going to work. I think I will need to play many more games before I can have a clear plan because it kept changing during the deployment! 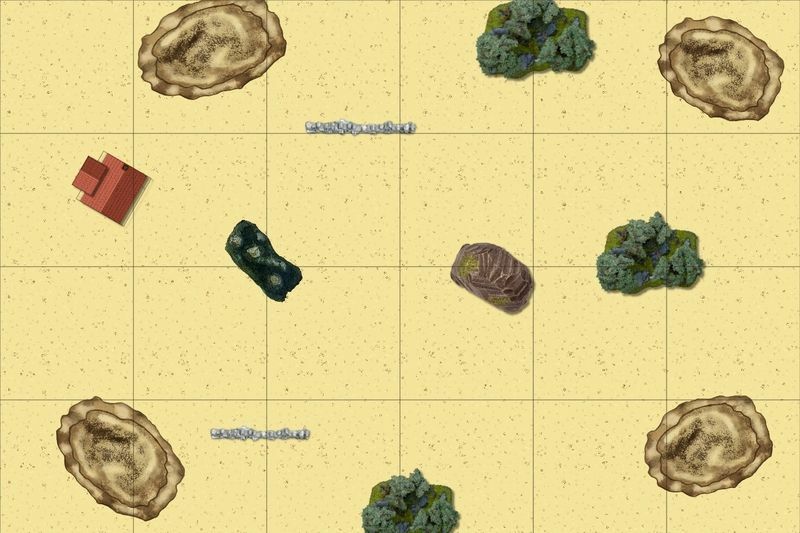 One of the interesting challenges about KoW for me is to assess the terrain well before the battle so that I can use it to my advantage. It helps to anticipate how my opponent is going to use it as that will affect his own plans. While it sounds obvious I really didn't know how Darth is going to do it. I only expected crossbows behind the wall and arbalests on the hill and I tried to adapt to that situation by strengthening the flanks and limit the number of targets, at least at the beginning of the game. 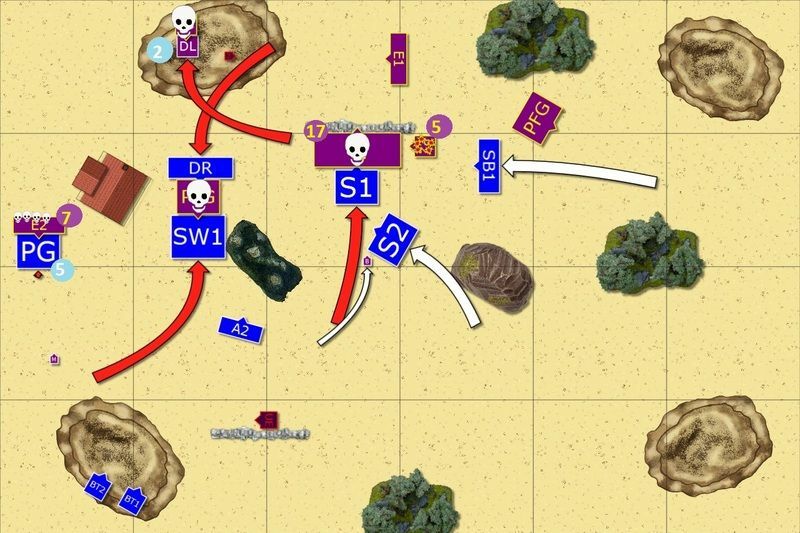 I knew it can be a trap for myself as in my previous games, against Empire of Dust, I put too many units on one flank and when one of them got wavered I could not really move properly or counter attack. I have also observed that deployment phase is a mixture of trying to form a plan, deploy according to it but also reacting and adapting to what the opponent does. And it is tricky because while I want to correct the initial idea and adapt to the situation I don't want to start reacting to my opponent. Because then he is having an initiative and I am one step behind. It was not a guarantee that my drakons would be able to fly over towards the crossbows and arbalests but that was that thing I wanted to try. It was also a similar move I made in my previous game against Orcs, although in both cases I tried to keep my options open. 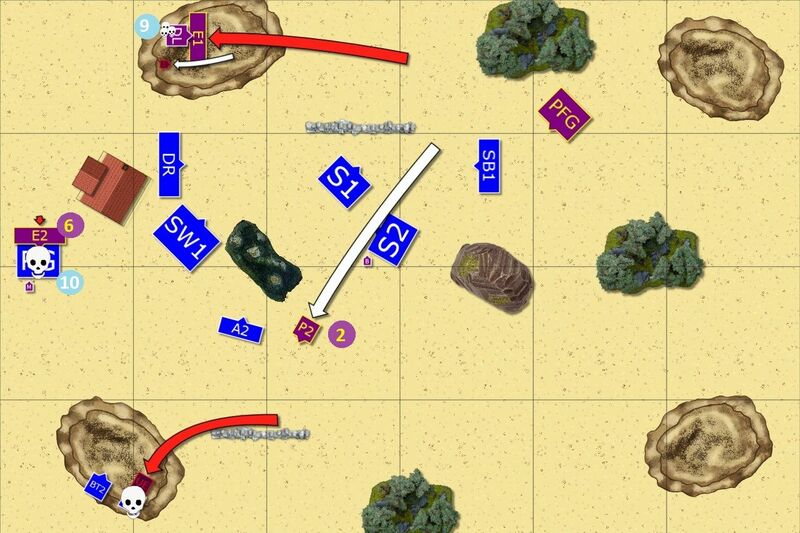 While the gap was created during the deployment I thought I need to do something to keep it open for a turn. If I moved there directly, Darth would have had more time to stop me I think. And I would not be able to avoid his fast troops or be out of line of sight of the crossbows. That feint move towards the right flank helped me to get into better position. I think it is important to remember that pivot and move gives you quite a lot of freedom of movement. Initially, I didn't think it is enough but now I try to see where my and enemy units can be by looking at their initial position and where they can get by pivoting first. It is in particular very important with nimble units and especially fliers. I am glad it worked but I am sure it will not next time :) However, I tried that mobility and I am very happy with it. 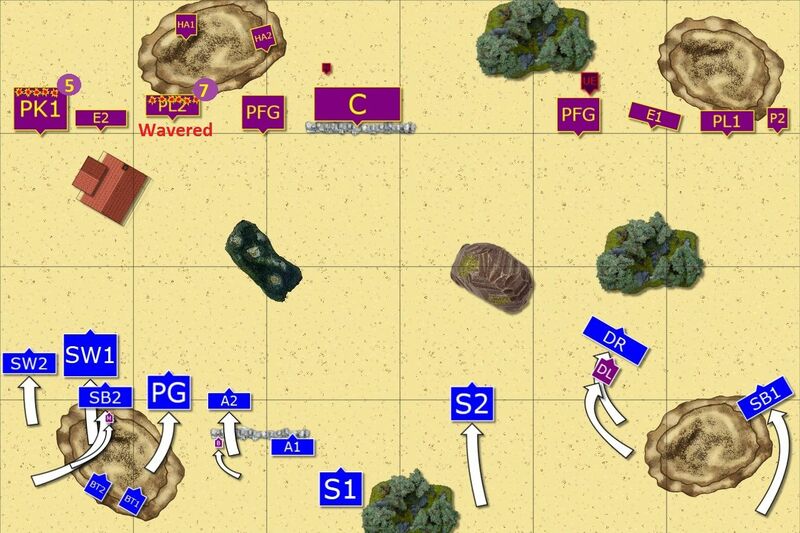 The situation on the other flank was different because there was not much space to maneuver. I had to be ready for some exchanges. 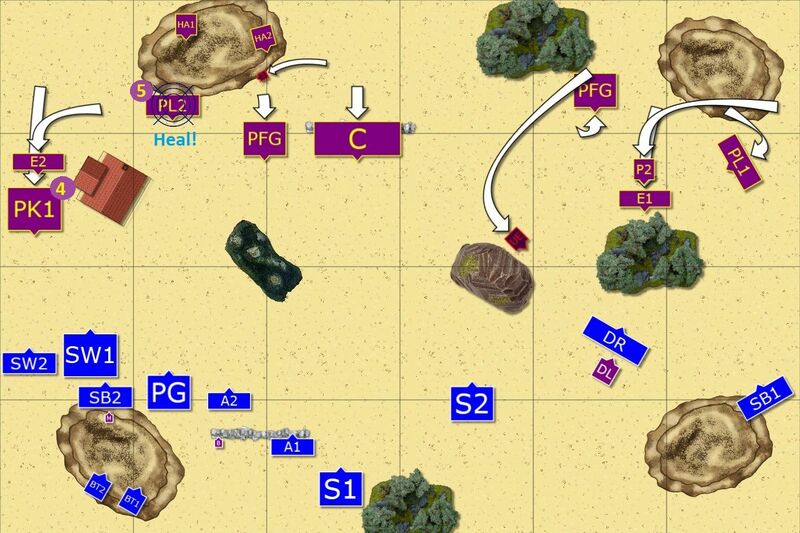 In the end I lost 2 units and got 2 units but won the flank. I am glad I managed to soften the Knights a bit and the shooting was more important for getting rid of Panthers that could and would interfere with my movement there. Darth exposed his Knigths for the charge but I sent smaller unit to hit them instead. My reason was that regiment of cavalry might have destroyed the enemy on the charge (especially that I got bane chant off) and then Elohi would get in. While regiment had better chances to hold the line they would have been stuck and deprived of their thunderous charge. On the other hand, Palace Guard had Crushing Strength all the time but what is more important, gave freedom of movement to Storm Wind regiment. Unfortunately, PG was routed anyway despite inspiring presence of nearby wizard. I am still happy with the exchange because I lost fewer points and more importantly, I eliminated fast and hard hitting units. We talked with Darth about the outcome and he said that from his point of view I had a massive advantage thanks to sheer speed (my units are faster than counterparts in his army) combined with very good shooting (4+ to hit) and supported by powerful Elite army wide rule. I agree these are indeed strengths of my army and I decided to have a closer look at these elements. I admit I am very happy with the amount of damage elven units can do. Relatively few attacks transfer into significant damage when hitting on 3+, re-rolling 1's and having either Crushing Strength or Thunderous Charge. However, I was once advised by Gatti, against whom I had a pleasure to play recently, that in KoW you still need to be ready for exchanges. Not all units will rout on a frontal charge. At least no unit in my army can do it against any opponent. That is the way I like to play where few units have to combine their effort. Knowing that it is possible to offer me something that I have to charge and then counter. In our game a good situation to show this is with the Knights. Darth knew he cannot just sit on the flank and wait because I would shoot at him. So his idea of forcing the charge was good. However, by moving the Knights forward he was risking the loss of TC and he also blocked Elohi from charging the regiment that has just attacked him because there was no space for them. I was thinking what would it be like if Darth moved Elohi to the front instead. They pose a bigger threat because they can fly over so I cannot ignore them. They have longer move distance and are also nimble which creates a larger threat area. On top of that they cannot be wavered so I simply had to charge them. Now here is where my dilemma starts. If I charge them with a regiment I might not rout them because they are not damaged yet and I may have too few attacks. If I don't then they are free to actually fly over and either attack other target or simply land in safe spot as well as start threatening my back yard. So I may charge them with big cavalry unit. But routing them is not a guarantee either. And even if I did I am in the open against the charge of enemy Knights! Another way to limit the effect of the charge by faster enemy could be by absorbing damage by horde formation and/or force charges through difficult terrain. Of course I had Pathfinder item on my heavy cavalry but it is only one unit. If I don't break the unit on the charge I am vulnerable. It is possible to attack the flanks since it is easy to predict where the units is after melee. Or even if you move forward and get charged so that you are routed means you know where the enemy is and you can attack with the second wave. My observation is (also from the games I watched) that instead of preventing charges people try to make you charge what they want instead. Elven shooting is indeed very good but I wanted to have a closer look at what I achieved with it during our game. I had 4-5 turns of shooting with most of the units so let's see what they accomplished. - Bolt Throwers - 5 wounds on the Knights, 7 wounds on Arbalest, 4 wounds on Phoenix and 3 wounds on Elohi. They were of course very helpful in routing the knights and Elohi but in both cases I needed melee to do the majority of damage and still lost two units in the process. The wounds inflicted upon the Phoenix feel like a waste and 2 turns of shooting at Arbalest and I still needed Darkon Lord to finish the job. - Archers - 3 wounds on panthers, 2 on crossbows, 1 on phoenix and 1 on Elohi. I think I am not using them well enough yet, I like the fact I can split the effort and target a few other units but I also keep thinking that maybe I should change them for something else? - Silver Breeze - lots of wounds on panthers and not much after that but I still like how they work and I think they are great. The shooting was without a doubt important part of the game but despite the fact I had some good rolls it was, as intended, a support. To either soften the enemy or finish it off when damaged. However, it can still be limited and Basileans in particular have some means to do so. For example, in addition to what I described about possible situation with the Knights I think it would have been fantastic if there was either Ur-Elohi or Phoenix on that flank. Both have healing abilities. Imagine then that Elohi jump to protect the Knights while the Paladins are healed. Then they proceed and Elohi are healed again in the meantime. Not to mention that this one more flying unit would help to shut down the shooters earlier too. Silver Breeze cavalry is fast but they cannot shoot at something they don't see. I think fragile Panthers should have been deployed later to avoid being singled out. And they can be kept behind other units for time being. You can still move what is in front of them and charge with these fast troops too! Foot Paladins, for instance, can safely move forward and shrug the little damage fast cavalry can do, also thanks to their Iron Resolve army special rule. Darth did great with his own shooting too! My archers had little chance to survive crossbows volley and arbalest destroyed fast cavalry with a single shot. So it is also possible to fight fire with fire. All in all I simply hope it can be good learning experience for both of us and that initial feeling of being frustrated is not going to last for long. I know I felt the same after my first 2 games against Empire of Dust. KoW is a good game in my opinion and it might just take a little time to get used to with its mechanics. I really hope Darth will come back with some new ideas and I am sure that it is just a matter of time when he gets his revenge!